Buy Online Now! 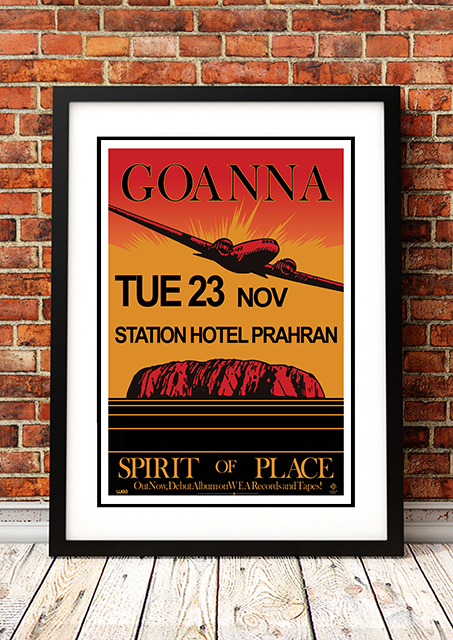 - Goanna Rock Concert Posters and Memorabilia. Goanna is an Australian folk rock group which formed in 1977 as The Goanna Band with mainstay Shane Howard as singer-songwriter and guitarist. The group integrated social protest with popular music and reached the Top 20 on the Australian Singles Chart with “Solid Rock” (1982) and “Let the Franklin Flow” (released under the name Gordon Franklin & the Wilderness Ensemble in 1983). Their debut album, Spirit of Place peaked at No. 2 on the related albums chart. They disbanded in 1987 and briefly reformed in 1998. 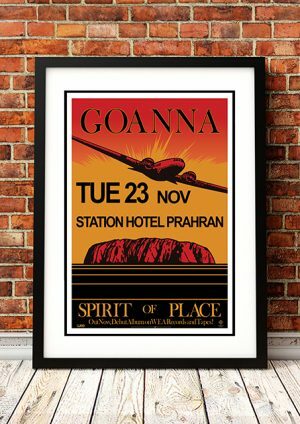 We stock a terrific Goanna Concert Poster. Available in different sizes and printed on high quality 210gsm paper, you’ll find no unsightly pin holes, stains or creases. In fact it looks like it could have come straight off the press from the original print run. Will look fantastic framed on your man cave, office, bar or living room wall.